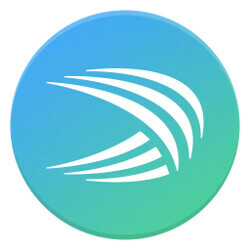 One of the best keyboard apps for Android devices, SwiftKey has just received a small update that brings a few new features and functionalities. If you've been using SwiftKeyfor the last couple of years, then you already know the developers often release meaningful update that add new features into the mix. The most recent update adds a new QWERTZ Swiss French layout. Also, the latest version of SwiftKey comes with QWERTZ extended layout for Swiss German and Swiss Italian. These new additions to the keyboard app should make it easier for those who use this type of layouts to type easier and faster. Next in line, the developers added the Incognito mode, which should temporarily stop SwiftKey from learning words or phrases. This way the application offers a decent level of privacy to those who absolutely need it. Last but not least, the update includes some bug fixes as well. For example, dragging the cursor while typing in Chinese should no longer cause a crash after the update. Furthermore, themes will now download after the first tap. The new version of SwiftKey for Androidhas already been pushed to Google Play store, so if you have the app installed on your device, make sure to check for the update if you want to benefit from the new features and fixes right away.